Navigation: Home » Personal Finance » How Much Do Americans Save, by Age? How Much Do Americans Save, by Age? It wasn’t too long ago when we posted our epic article (and corresponding calculator) on the ideal savings rate. Since the Bureau of Labor Statistics recently released their 2012 statistical tables from the Consumer Expenditure Survey, I figured it might be interesting to look at how much American savings by age. If you want to see how I generated this chart, please read on for methodology. You will, of course, immediately notice there are two savings rates calculated. The Consumer Expenditures offers two ways to calculate savings rates, both of them pretty inaccurate: you can use Income After Taxes and subtract Expenses (CEX data is self-reported), or you can use Increase in Assets. Since both are pretty bad, I just reported both of them. Actual savings rates are, of course, lower than what either measure implies (because self-reported taxes are too low in the CEX) – but remember these are ostensibly net – after tax – savings rates. Another limitation? This data is based on only 9 data points. So, of interest to most of the readers on this site (and according to our admittedly weak data! ), a 30 year old saves roughly 15% of his or her income after taxes. This is household data; please see the source material to see the household size by age. Want to run the numbers on your own savings? Why should you track your savings rate? What’s the ideal savings rate for your goals? How Has Your Savings Rate Changed? Sure, the data is weak, and it implies higher savings rates than the official reported savings rate. Of interest, perhaps we’re in the ballpark on this one – so use this calculator as a jumping off point (and, of course, note that you probably want to beat the results it gives you). If you want to see some other work we’ve done on the CEX in the past, see our sin tax calculator and our American food spending calculator. With all that in mind, how do the numbers look? 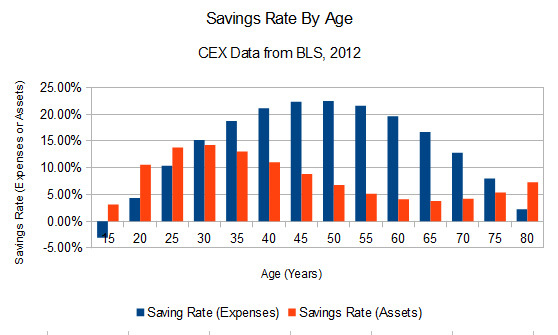 How did your savings rate (after tax, or net savings rate) change based on your age? Did you save more as you got older? Thoughts on American savings by age? $65,596 was the reported average income before tax. $63,370 was the reported average income after tax. $51,442 was the reported expenditures. $5,073 was the reported average increase in assets. American do not save enough! That said, I believe that everyone should be automatically enrolled in a 401k and required to contribute something. Once they get started it is much easier to save. My company does this – 3% if you don’t opt out, and an automatic update program (1% a year, don’t know where it stops). Blink/nudge/all that stuff – it works, in aggregate! I’ve been on a “savings tip” (as opposed to “savings tips, I guess?) since I finished the kitchen. Three Mondays in a row? Better switch things up soon, haha. Most people need to save more. I’m pretty sure people are not saving nearly as much as those statistics indicate even though they should be saving at least that much.